This is the second in a series about nine clients and friends who successfully transitioned or transformed their careers after age 50. This month I will describe how one former client shifted from a marketing leadership job to multiple overlapping jobs after age 50. 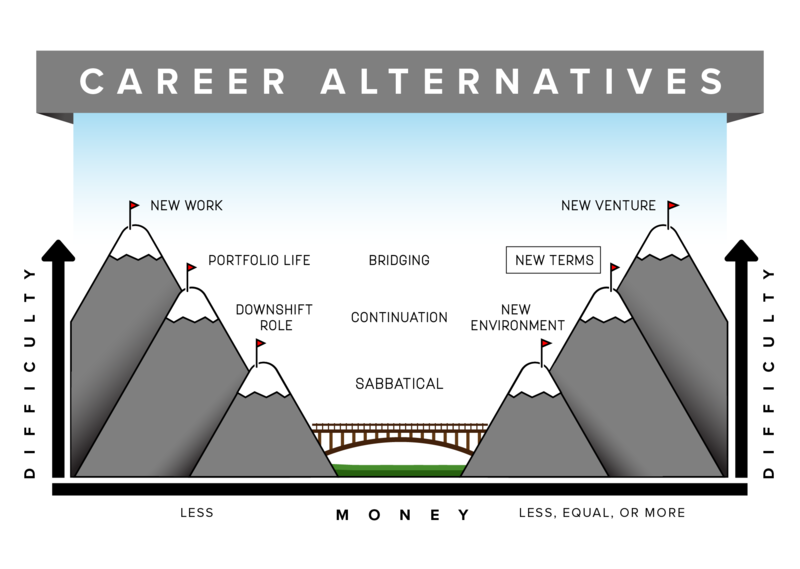 The graphic above illustrates the degree of difficulty and the economic considerations for the portfolio of work option I call “new terms.” This career alternative involves a change in terms of compensation and time commitments. This may include consulting, contract work, interim, and/or flexible schedule. The ultimate goal is to replace the income of one job with that from multiple jobs worked concurrently or sequentially. ﻿While preparing to share his story, I asked Bill to consider what most readers would like to know about him and his journey. First, I asked about his background, who he is, and where he worked before his transition. Second, what was the catalyst for his career change? Third, what were the results of his search, and how and where did he ultimately land? Fourth, I asked Bill for reflections and lessons learned which could help others who might be considering a similar next step for their career. Most recently, Bill had worked for several years at a national non-profit as Director of Marketing. His background included marketing leadership roles at both for-profit and non-profit organizations, and teaching college for nearly 8 years about 20 years ago. Bill is an experienced and highly skilled marketer, public speaker and instructor. He was approaching retirement age, but told me he still had the energy and ability to take a few more laps. Bill’s career was frequently disrupted by changes in his wife’s employment. His wife is a corporate executive who was recruited multiple times to new opportunities in different parts of the country. Bill was happy to support his wife in her upward career movement, and has taken on many additional home duties, including hosting and entertaining associated with having a high profile spouse. Bill’s wife’s new job required them to live in a smaller community where his opportunities were limited. He could network with some of the people associated with his wife’s new employer, but this would call for some challenging networking efforts on Bill’s part. Bill become more committed to networking as time passed, and grew an impressive collection of sponsors who ultimately helped him land multiple opportunities that added up to the equivalent of a full-time job. Bill now has a portfolio of work, including two classes he teaches as an adjunct professor at a local university, and a half-time marketing job at a larger non-profit. This marketing job was created just for Bill due to his excellent marketing and social media skills and knowledge. He needed to cultivate this opportunity over several months, and eventually convinced the Executive Director of the benefits and affordability of having him engaged half-time. Bill’s success in securing this position is also due in large part to his commitment to staying current with social and digital marketing tools and strategies. At the beginning of his career transition, isolation was Bill’s default mode. He confided in me that the stress associated with his circumstances had at times become debilitating. At one point he decided to approach a therapist and physician to see if counseling and medications might help what had become a growing social anxiety. Because Bill got the counseling and medication he needed to reduce his anxiety, he was eventually able to network effectively. Bill overcame his tendency toward isolation, and ultimately landed the three jobs that now constitute his portfolio of work. If this sounds familiar to you, don’t be too proud to reach out for psychological and/or medical help if the situation calls for it. In the end, Bill established great new relationships through church, civic and other organizations. He would advise you to first and foremost avoid isolation, make community connections and set and keep networking goals. Have faith that it gets easier over time to network and to reduce the anxiety associated with this process. Bill would also advocate staying current in the latest tools and teachings within your profession. Especially if you are over 50, this is a significant differentiator. While you are in transition, or considering a transition, is there some coursework, reading or project that will help make you a more attractive candidate in your field? Stories help us understand the realities, struggles and triumphs of life and work. With Bill’s help, I have told his story in the hope that you will see greater possibilities for yourself and others. 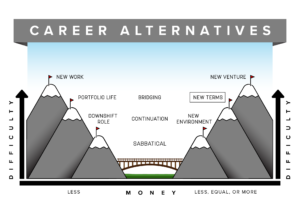 Join me next time, as I explore another path of career transition and transformation after 50.